I had recently come across a jar of tamarind paste in the back of my fridge that I had picked up a while ago and hardly used. I wanted to experiment some more with the tamarind and while I was searching for recipes I came across this one for tilapia baked in a tamarind sauce which sounded really good. I like baking fish in sauces as they come out nice and moist full of the flavour of the sauce. This particular tamarind sauce is a Thai recipe. One of the things that I like the most about Thai recipes is that they tend to try to balance sweet, sour, spicy and salty. It is a god idea to sample the sauce after everything has been added to it and then tweak it to your tastes. The tilapia baked in tamarind sauce turned out really well! The tilapia was nice and moist and the tamarind sauce was really tasty. I served the tilapia with some coconut jasmine rice which provided a refreshing contrast to the flavourful tilapia. So far I have really been enjoying tamarind and I look forward to using it again. Heat the tamarind, water, lime juice, fish sauce, palm sugar, chili sauce, shrimp paste, garlic and ginger in a small sauce pan and stir to combine. Taste test the sauce to ensure that the sweet, sour, salty and spicy aspects are balanced. Pour 1/2 of the sauce over the tilapia in a baking dish and make sure that the tilapia is fully coated in it. Bake in a preheated 350F/180C oven until cooked, about 10-12 minutes. Serve with the remaining tamarind sauce, sliced green onions and red chillies. Oh man, you’re a blogging machine! I can’t keep up with you. This looks extra delicious. I don’t have much experience cooking with tamarind, maybe i should give it a try too! I am totally drooling now. This is my favorite dish. I am so surprise that you like Tilapia. 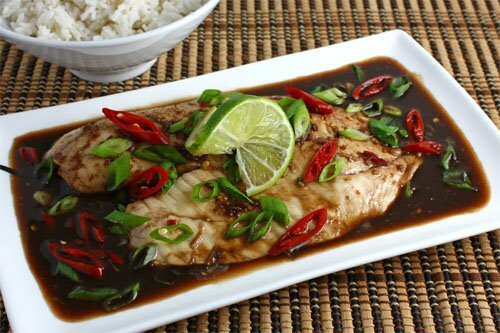 Most Asian love Tilapia, that’s why you see them a lot in Asian recipe. I love Tilapia! This looks amazing. Great-looking tilapia! Sure looks delicious. What a beautiful dish! Love thr sound of that sauce. Looks fantastic. Tamarind is highly underrated. It’s great. I have had tamarind many many times but never savory. This looks really good and interesting! Wow….this looks so good! I am sure the tamarind sauce tasted yummy! Ahh. tamarind! That looks sour n spicy. Wonderful! Oh tamarind! I am addicted to the stuff. Especially raw out of the pod. On my goodness. I hate fish but I would snarf that up in a minute! Excellent! Sounds like something really easy! Hi! I really like your blog… you seem to have great ability in cooking! This looks really delicious Kevin. Another great recipe to try. Looks awesome! I love thai food! That is a gorgeous plate of food! What a gorgeous recipe Kevin! It looks so delicious! Kevin, your recipe is first class for a delicately-flavored fish that I and my wife love. BUT, I hope that you (and your readers) are aware of the dangers of eating tilapia imported from fish farms in china. Many supermarkets (such as Food Lion), and some fish “markets”, sell the tilapia for as little as $2.99 per pound, and the price is very enticing. We are very careful to examine the source of our tilapia before purchasing it. We would urge your readers to research the dangers of purchasing tilapia imported from china. I’ve been visiting your page regularly for months, and I finally had to leave a message..
Great dish, beautiful ,maybe next time you could try to bake it in banana leaves, you’ll be surprise, how it’ll taste. If you marinate fish with tamarine it’ll give this beautiful colour when you (quickly)deep fried. Do you have any more leftover tamarind? I bet it tasted wonderful with the coconut rice. Looks amazing. We’ve been trying to eat fish once a week (to no avail since we’ve had the little one for the summer) This looks like something I could attempt… they sell whole tamarind pods at our market. how does all your food manage to look so good? been reading your blog for a while and I’m a big fan– I definitely want to branch out and just cook a lot of random stuff. since i’m just starting a food blog…. how do you link websites you like on your site? Yum… this looks great Kevin! I love this dish, looks really delicious! Where did you find the Tamarind paste? amandalouden: I found the tamarind paste at a local Asian grocery store. Tamarind is such an interestign flavour – my Mexican friend has these crazy salted tamarinf sweets that she’s addicted to 😉 I also love naking fish – it’s so easy and the end result is so flavoursome. Love the colours of your dish too! Hi! I am a new food blogger, but been lurking to your blog for a while. Love your photos!!! I wish mine can look like that. 🙂 So thrilled to see your fondness in Asian cuisine! Oh gosh! This is so nice yummy! I could smell it from here! I love fish being handled this way! This pictures looks like it was taken in a restaurant. The food looks so good on that plate. wow, what a great use of the tamarind! Fish and tamarind sounds very good to me… I missed so many of your recipes this week!! I’ve been very busy… I’m trying to set up my own online store and spent ours searching wholesalers. Anyway… I love the recipe, same cherry clafoutis sounds delicious… I made one before but with mixed berries. Did you find this to be overly salty? Sometimes when I work with tamarind I can hardly swallow due to the saltiness, do you have any tricks? holy crap, i absolutely cannot believe how many wonderful recipes you have here. i am going to try so many of them! this will keep me busy for years!!! Awesome looking Tilapia and sauce sounds wonderful!